Early German Immigration to America - For the early immigrants leaving home was not easy. Local governments often barred emigration out of German territory. They often had to get a dozen or more permits from the state. Many had to give up their citizenship upon leaving. Gottlieb Mittelberger, left a good record of his emigration journey in 1750, his trip occurred almost twenty years after our ancestors began traveling across the Atlantic. He says, “The journey lasts from the beginning of May until the end of October, that is, a whole of six months, and involves such hardships that is really impossible for any description to do justice to them.” Our ancestors route was the same as Mittelberger’s, down the Rhine to the Dutch port of Rotterdam and from Rotterdam to the port of Philadelphia. The small sailing ships were crowded. As Mittelberger put it, people were packed “as closely as herring.” Each person’s sleeping space was barely two feet by six feet. Mittleberger describes the journey: “During the journey the ship is full of pitiful signs of distress – smells, fumes, horrors, vomiting, various kinds of sea sickness, fever, dysentery, headaches, heat, constipation, boils, scurvy, cancer, mouth-rot, and similar afflictions, all of them caused by the age and the highly-salted state of the food, especially of the meat, as well as by the very bad and filthy water, which bring about the miserable destruction and death of many. Add to all that shortage of food, hunger, thirst, frost, heat, dampness, fear, misery, vexations, and lamentations as well as other troubles. Thus, for example, there are so many lice, especially on the sick people that they have to be scraped off the bodies. All this misery reaches its climax when in addition to everything else one must also suffer through two or three days and nights of storm, with everyone convinced that the ship with all aboard is bound to sink. In such misery all the people on board pray and cry pitifully together.” On these early voyages nearly one out of seven people died on the trip out of Germany and across the Atlantic. Once in America many who could not afford to pay for their passage would be put up for sale as indentured servants for a period of time to pay off their passage. Usually they would bind themselves by contract to serve for three, four, five or six years. The very young (10 – 15 year olds) would have to serve until they were twenty-one. Orphaned children were indentured for the cost of both their parents’ fare and their own. Between 1727 and 1740 eighty shiploads of Palatine Germans arrived in Philadelphia, many more followed. Benjamin Franklin estimated that at the time of the Revolutionary War, one out of every three Pennsylvania residents were of German decent. The Huguenots – The Huguenots were French Protestants, Christians committed to the reformed teachings of John Calvin. The French Roman Catholics gave them the name Huguenots. The French Government and Catholic authorities often persecuted them. Beginning on August 24, 1572 several thousand Huguenots were murdered in the Saint Bartholomew’s Day massacre, which lasted several days. In 1598 King Henry of Navarre issued the Edict of Nantes, which gave the Huguenots freedom to worship in 75 towns and cities where Calvinism prevailed. The edict also gave them complete political freedom. They lost their political freedom during the reign of Louis XIII, but they were still allowed freedom of worship. In 1685 Louis XIV repealed the Edict of Nantes, the persecution of the Huguenots resumed. Thousands of Huguenots fled France to Germany, England and America. David Daniel Bonnette (about 1658 – 1736) – Born about 1658, the son of Jean and Jeanne Bonnette. He married Christine Causine about 1692. David and his family were Protestants, French Huguenots, who fled with his family from the Piemont area because of persecution after the Edict of Nantes was repealed. They settled in Friedrichetal, Baden, Germany where David and Christine raised their family. David died on September 4, 1736 in Baden, Germany. Jean Jacques Bonett (1702 – before 1753) – Jean Jacques (Jacob) Bonett, the son of David Daniel and Christine Bonette, was born in 1702 in Germany. He married Anna Marie Desreux, the daughter of Abraham and Judith Desreux on October 19, 1723. Jean and Anna Marie had ten children. They immigrated to Pennsylvania arriving at the Port of Philadelphia on the ship “Elizabeth” out of Rotterdam on August 27, 1733. Two of their children, Susanna (age 4) and Christina (age 2) died in route. They settled in Chester County, Pennsylvania where he died sometime before 1753. Samuel Bonnett (1738 – 1789) – Samuel Bonett was born in 1738 in Paoli, Chester County, Pennsylvania, the son of Jean Jacques and Anna Marie Bonett. He married Mary Elizabeth Lorentz in Chester County, Pennsylvania in 1755. They had twelve children. Samuel moved to the Cedar Creek area of Frederick County, Virginia (later Hampshire County, West Virginia). Samuel received a land patent dated 1766 for the purchase of 205 acres of land in that area. This land was sold in 1777 and the family, with the exception of their son Henry, moved over the mountains to Harrison County, (West) Virginia. He obtained a land grant there for 400 acres. Samuel died on December 17, 1789, from the fall of a tree. William B. Bonnett (1774 – 1858) – William Bonnett was born on September 14, 1774 in Hampshire County, (now West Virginia), the son of Samuel and Mary Elizabeth Bonnett. He married Barbara Harpold on March 3, 1799. They had twelve children. His daughter, Elizabeth married Isaac Newton Flesher. They were pioneers, moving from Harrison County to Mill Creek, at Ripley, in Jackson County, West Virginia. He was one of the first to build a log cabin in the heart of Jackson County along with Thomas Carney and George Castro, Sr. William Bonett died on July 10, 1858, in Jackson County. 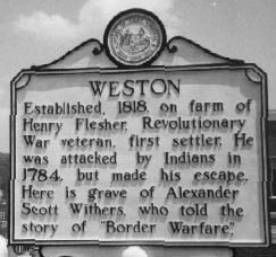 Henry “Weston” Flesher (1734 – 1803) – Henry Flesher was born on November 12, 1734 in Ober-Seemen, Heese, Germany, the son of Balthasar and Anna (Schmidt) Fleischer. Henry immigrated to America with his older brother, Peter and family, arriving at the Port of Philadelphia on the ship “Phoenix” on November 2, 1752. Peter was a shoemaker by trade and had apparently taught his trade to his younger brother Henry. Once in America their name became Flesher. They moved to the German community that had been established on the South Branch of the Potomac River in what is now Pendleton County, West Virginia. Henry married Elizabeth Bush in 1759. They had twelve children. In 1776 he moved his young family west settling at the mouth of Stone Creek on the West Fork River in what is now Lewis County, West Virginia, acquiring 400 acres. In 1781 frequent Indian attacks led Henry to take his family to Fort Buckhannon where they stayed until March, 1782, when they moved on to Fort Richards. All of the adult men took their turn guarding and scouting. Henry returned to his farm in 1784 (present day Weston, West Virginia). In October, 1784, Henry had been hauling logs for a stable. On the way to his cabin to get a bell for his horse he was turning loose to graze in the woods, Indians fired upon Henry in an ambush. Severely wounded by a ball passing through one of his arms, he managed to run to the cabin, pursued by a band of howling Indians. Others inside the cabin fired on the Indians as Elizabeth Flesher pulled her husband to safety. The attackers then retreated. Fearing a renewal of the attack, the family fled to the woods where Edward Hughes found them and led them to the West Fork. In 1786 he obtained title to an additional 400 acres of land. Henry died in February, 1803, in Weston, Lewis County, West Virginia. Elizabeth died in 1807 in Weston. Andrew S. Flesher (1771 – 1850) – Andrew S. Flesher, the son of Henry “Weston” and Elizabeth Flesher, was born on May 1, 1771. During his childhood he experienced the hardships of the Indian wars during the Revolutionary War period. He probably witnessed is father being attacked. On February 14, 1793, he married the fourteen-year-old Elizabeth Bibbee, daughter of John and Susannah Bibbee, of Ravenswood, which is on the Ohio River 100 miles west of Weston. Two months after they were married Henry Flesher deeded 168 acres to Andrew. Andrew and Elizabeth had eighteen children. In 1807 they moved west to the Ohio River near Old Town Barr, Jackson County, West Virginia. Andrew died in Jackson County, West Virginia on October 1850. Elizabeth died on January 9, 1856. Isaac Newton Flesher (1796 – 1841) – Isaac Newton Flesher was born on Nov 22, 1796, the son of Andrew and Elizabeth (Bibbee) Flesher. Isaac Newton Flesher was a soldier in the War of 1812. He married Elizabeth Bonnett the daughter of William and Barbara Bonnett on July 14, 1814. They had eleven children. Isaac died on June 29, 1841. Elizabeth was left a widow with eight children to support. In 1859 Elizabeth was allowed bounty land on Goose Island in satisfaction for the services rendered by Mr. Flesher in the War of 1812. Elizabeth died on March 3, 1889 in Reedsville, Meigs County, Ohio. Rev. Thomas Dungan (1634/35 – 1688) – Thomas Dungan was born in London, England, the son of William and Frances (Latham) Dungan. In 1637 or 1638 his mother and stepfather, Jeremiah Clarke, moved their family to Rhode Island to escape persecutions under King Charles II. As early as 1655 he was living at Newport, Rhode Island, where he was sergeant of the Newport Militia in 1676. In 1678 and again in 1681 he was elected to the Rhode Island Assembly. In 1677 Thomas Dungan, along with forty-seven others, took a grant of 5,000 acres to be called Eash Greenwich. Thomas married Elizabeth Weaver, the daughter of Clement and Mary (Freeborn) Weaver, in 1663. Thomas and Mary had nine children. Thomas was educated for the ministry under Rev. Roger Williams and Rev. William Vaughn. In 1682 he sold his property in Rhode Island and moved to Pennsylvania. Rev. Dungan was the first Baptist pastor in the Colony of Pennsylvania. He settled in Cold Spring, Bucks County, Pennsylvania and founded the first Baptist church in Pennsylvania 1684. Rev. Thomas Dungan died in 1687. John McKibben, Sr. (1728 – 1798) – John McKibben was born in Ireland in 1728. The McKibben family origins were the lowlands of Scotland. He immigrated to America sometime between 1745 and 1748 with his two brothers Joseph and Thomas. John married Sarah Coburn about 1754. They had eight children. Three of their sons fought in the Revolutionary War. Their daughter, Sarah, married Robert Doak. John and Sarah McKibben were early settlers in western Pennsylvania. John built a large log house with a stockade around it for protection from the Indians sometime between 1772 and 1774. The McKibben home was often a refuge for families in the area. Here is how one account of an August 1777 incident is described: “The reapers in the oat field, when they were appraised of the presence of Indians, left to notify the people, taking their guns with them and going to the house of John McKibben, where several families had collected for safety in McKibben’s large log house.” The McKibben home became Fort Hand in 1777 and the stockade was fortified for the Revolutionary War. Fort Hand was burned in an attack in April 1779 and abandoned in the fall of 1779. The first Presbyterian Church service west of the Alleghenies was held in John McKibben’s log house on the second Sunday of August 1775. One history of Westmoreland County (later divided into Beaver, Washington and Allegheny Counties) states that “the town of New Salem was laid out by one John McKibben.” John died in Cross Creek Township on August 25, 1798. Robert Doak (1750 – 1838) – Robert Doak was born in County Antrium, Ireland in 1750. He immigrated to the Colony of Pennsylvania with his three brothers in 1767. He enlisted in Captain Hay’s Company in Northhampton County on January 6, 1776. This company was associated with others under the command of Colonel Siegfried and became a part of Col. Trespaugh’s Battalion of Pennsylvania troops. Robert served as a soldier from January 6, 1776 to March 8, 1783. He fought in the battles of Germantown and Brandywine among others. He was one of the soldiers camped at Valley Forge in the winter of 1777 – 78 suffering from cold and lack of proper food and clothing. On the general roll of the Revolutionary forces dated May 14, 1778, his Company is the 6th Company of the 4th Battalion. Captain John Ralston was the commander. Bothers Robert, Moses and James Doak are on the roll of the company, which consisted of 83 men, James Doak being the Quartermaster. Robert married Sarah McKribben the daughter of John and Sarah (Coburn) McKribben in 1784. They had ten children. He built a log cabin home and established a farm. (Located on land that is now Raccoon State Park in Beaver County, PA.) He was one of the subscribers to a school conducted by Rev. John Taylor. The school opened on May 2, 1779. Rev. Taylor, a Presbyterian, probably also preached in the school building. Rev. Taylor left for a larger opportunity and began teaching school in Pittsburgh on June 1, 1880. Robert would travel about 30 miles to attend a Presbyterian church at Buffalo Village in Washington County. This church was founded in 1779 as the result of a revival. Robert would leave on Saturday and ride the 30 miles to church carrying his rifle to guard against wild beasts or Indians. After Sunday services he would return home on Monday. In 1784 Mill Creek Presbyterian Church was organized. Robert Doak was one of the charter members. Robert was chosen to pick up Rev. Scott, a professor at Princeton, and bring him back to be the first pastor. Robert left home in his Conestoga wagon on May 27, 1799 and arrived at Princeton, New Jersey, on June 17. On July 1, they left Princeton and arrived at Mill Creek in Beaver County, Pennsylvania, on July 20, 1799. The total travel distance was over eight hundred miles. To pay for his services the men of the congregation put up his harvest for him that fall. Robert died on October 4, 1838, at the age of 88. Sarah died on June 18, 1838. They are buried in the Mill Creek Church cemetery. Moses Doak (1797 – 1880) – Moses Doak, the son of Robert and Sarah (McKribben) Doak was born on September 17, 1797. He was a farmer and a stone mason. He married Rachel Stephens the daughter of Isaac and Rachel Stephens on May 18, 1815, at Mill Creek Presbyterian Church. Moses and Rachel had ten children. During the Civil War he learned that his son William was badly wounded in the battle of Gettysburg and was in a hospital in Philadelphia. He went to be with his son who eventually recovered from his wounds. Rachel Died on October 11, 1871, and Moses Doak died on May 25, 1880. Isaac Doak (1817 – 1892) – Isaac Doak was born on June 29, 1817, the son of Moses and Rachel (Stephens) Doak. He Married Rachel Beal. Rachel and Isaac had eight children. Their daughter Mary Clementine Doak married Finley Cooley. Isaac died on July 13, 1892, and Rachel died April 20,1913. Andrew Jackson Flesher (1827 – 1898) – Andrew Jackson Flesher was born on January 2, 1827, in Jackson County, West Virginia, the son of Isaac Newton and Elizabeth (Bonett) Flesher. He married Sarah Melissa Weaver on September 5, 1847. They had five children: Flavius J, Millard F., William A., Benjamin T. and Andrew Jackson, Jr. Sarah died on May 18, 1857. Andrew married Sarah Barrett, the sister of Captain John Barrett on July 15, 1858. They had nine additional children. Andrew Jackson Flesher began building boats when he was sixteen years old and continued in that business for fifty-five years. He owned a sawmill and boat yard at the village of Antiquity in Meigs County, Ohio. He purchased an interest in the boat yard at Murraysville, Jackson County, West Virginia, and ran it with the remaining owner R. W. Skillinger. Murrayville became famous for building steamboats. Many boats that were household names along the Ohio and Mississippi River were built at Murraysville. Captain A. J. Flesher became one of the foremost boat builders in the Ohio Valley. Captain Flesher owned thirty Ohio River steamers (although not all at the same time.) He built over one hundred-fifty vessels for others. The boat built at the Flesher boatyard was the Henry M. Stanley, built in 1890. A. J. Flesher then moved to Ohio and for a time ran the Barrett boatyard at Levanna, OH. At age sixteen Andrew joined the Methodist Episcopal Church and was known for living an exemplary life. Under the leadership of Captain A. J. Flesher and his partner Murraysville became almost a model town for sobriety, good order and morality in general - which is saying a good deal for a river port town. A newspaper writer commenting on this in 1876 stated that there had not been a whiskey shop kept in the place for 30 years or more and that “as long as Captain A. J. Flesher and R. W. Skillinger run the yard it may be safely predicted that whiskey will get but a poor foothold in the town”. A. J. Flesher never used tobacco in any form and was never heard to utter a profane word. He was known for his honesty and for being talkative and jovial. Captain Flesher soon became prosperous. The Ohio River flood of 1884 swept away a large part of his wealth. He accepted the loss with Christian resignation saying Providence intended it and that there was no use for him to worry over it. He was generous and was the major supporter of the Methodist Episcopal Church at Murraysville. A. J. Flesher was on the board of trustees of the Murraysville Methodist Church and the land on which the church was obtained from him. Andrew valued education, even though he did not have the advantage of an early education. He employed a teacher and paid him out of his own pocket and invited his neighbors to send their children to the school established at his expense. The 1891 Meigs County Business Review states the two individuals who have done the most to advance the interests of Antiquity, Ohio are Mr. Henry Harpold and Mr. A. J. Flesher. Finley F. Cooley (1846 -1919) – Finley F. Cooley was born on August 19, 1846 in Georgetown, PA, the son of John M. and Mary (Hutchinson) Cooley. He was a Civil war veteran. Finley’s occupation was a farmer at the time of his enlistment. He enlisted as a Private in Company C, 104th Infantry Regiment, Ohio, on August 25, 1863, and transferred to Company I, 183rd Infantry Regiment, Ohio, on June 15, 1865. He mustered out on July 17, 1865, in Salisbury, NC. While with the 104th Regiment, Finley’s Company participated in battles at Knoxville, TN; Resaca, GA; Cartersville, GA; Dallas, GA; and Pine Mountain, GA. On June 14, 1864, at Pine Mountain, Finley was sent to the rear because he was ill with bronchitis and pneumonia. Finley was later transferred to a hospital in Cleveland, OH, because of the severity of his illness. He returned to duty on August 30, 1864. After returning to the 104th, he was involved in fighting at Columbia, TN; Franklin, TN; Fort Anderson, NC and Town Creek, NC. Finley married Mary Clementine Doak, the daughter of Isaac and Rachel (Beal) Doak on May 20, 1869. Finley and Mary had ten children. They lived in Georgetown, Beaver County, PA. Mary died on January 21, 1890. By 1891, Finley is a potter living in East Liverpool, Ohio. Before his second marriage, the children were split up and sent to live with whoever would take them in. Orin Cooley was adopted by Isaac Oliver Doak, Mary (Doak) Cooley’s brother, and his surname changed to Doak. Velva and Fred Cooley went to live with a family who owned a store. They had to work at the store for their room and board. Finley married Linnie Allison on May 11, 1893 in Monaca, PA, and had two more children. Finley Cooley died on September 30, 1919 in East Liverpool. Linnie Cooley died on August 3, 1940. Millard F. Flesher (1849 - 1914) – Millard Flesher was born on December 25, 1849, he was the son of Andrew Jackson and Sarah Melissa (Weaver) Flesher. He married Lydia Chambers the daughter of William and Elizabeth Chambers on December 28, 1870. They had two children, Sarah Elizabeth Flesher and William Jackson Flesher. Lydia died on May 1, 1877 at age 25, she is buried in Sand Hill Cemetery, Long Bottom, Ohio. In the 1880 Federal census of Meigs County, Ohio, (Olive Township, Long Bottom) Millard Flesher, age 29, is a widower living with his father-in-law and mother-in-law and family, with his two children, Sarah E. age 7 and William J. age 5. His occupation in the 1880 census is listed as being in the steamboat/river transportation business. On June 6, 1883 Millard married Amelia “Millie” Walters (Mrs. Amelia Flinn) and in November 1884 their son, Guy K. Flesher, was born. In 1884, Millard, his brother Benjamin T. Flesher and M. V. Sayre purchased the Antiquity Mill Company, Antiquity, Ohio. In 1891 the mill (Flesher, Sayre & Flesher River Side Mills) was said to have the capacity of turning out twenty thousand feet of lumber a day for boat building. In the 1900 census Millard’s occupation is listed as steamboat captain. In 1900 he is living in Middleport, Ohio. By 1907 the Flesher’s steamboat business operations were moved from Middleport, Ohio to Mount Vernon, Indiana. Millard and his younger brother, Isaac Newton (Newt) Flesher, moved to Mount Vernon. Amelia Flesher died in 1905. In the 1910 census Millard is in Mount Vernon, Indiana, listed as living alone, a widower, age 60 and his occupation is a steamboat engineer. Millard Flesher died on June 19, 1914 in Arkansas City, AR and was buried in Beaver Cemetery, Beaver County, PA.
William Jackson Flesher (1874 – 1956) – William Jackson Flesher was born on December 2, 1874, the son of Millard and Lydia (Chambers) Flesher. As a young man “Bill” worked on the riverboats on the Ohio River. He also worked in a coal mine, in the timber industry and with the state road department. He married Velva Bell Cooley, daughter of Finley and Mary (Doak) Cooley on August 28, 1901 at Four Mile Presbyterian Church, Beaver, PA. William and Velva Flesher had seven children. They moved to Brighton Township, Beaver County, Pennsylvania, in 1920 where William purchased land and farmed. William J. Flesher died on March 24, 1956. Eva Engle Flesher (1909 – 1985) – Eva E. Flesher, the daughter of William Jackson and Velva (Cooley) Flesher, was born on December 21, 1909 in Industry, Beaver County, Pennsylvania. She married Harold Aquilla Bryner, the son of Ezra W. and Grace (Stover) Bryner, on September 14, 1927. Harold and Eva had six children. Eva (Flesher) Bryner died on May 31, 1985 after a long illness in the home of her daughter. Written by Bob Krepps © 2001 all rights reserved. Permission granted to copy for personal & non-commercial purposes only. The Bonnet-t-e’s & Kin, Vol. 18, pages 1 – 7, Records of the Reformed Church at Freidrichetal. The town of Weston was briefly named Flesherville in 1819 before the name was changed to Weston.